Yes, we love things that sparkle. Especially when it comes to websites and handcrafted arts, so naturally we want to share the recent update the Jira Collection website has gone through. Andrea Jira, a Columbia based jewelry artist, sells her unique handcrafted pieces online in addition to the occasional special exhibit in retail stores throughout the state. Before: JiraCollection.com looked nice, but was slightly outdated and not doing everything the owner required for her online business. We first built Andrea’s online store in 2008. The site utilized the e-commerce Zen Cart system to sell items to anyone just about anywhere. Since then, Zen Cart has undergone several updates and changes, not all of which the Jira Collection website preferred. As technology and systems change it’s important to evaluate these changes and make decisions about whether the modifications continue to suit the website’s goals and intentions. The most recent changes prompted Andrea to reevaluate not only how her website was working for her, but also her hosting situation. After consulting with Monica Pitts, a friend and web guru, Jira decided it was time for a website overhaul. After Andrea decided to host the website with Tranquility Internet, MayeCreate proceeded with building a brand new e-commerce site for the Jira Collection. 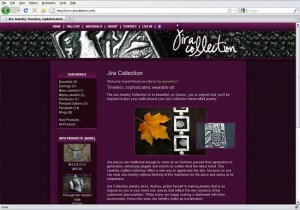 After: The freshened look and updated system for JiraCollection.com. 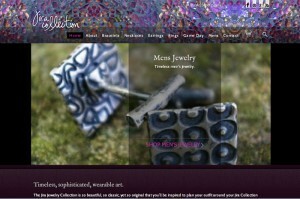 The new website, which can be seen at JiraCollection.com, utilizes WordPress and it’s [optional] e-commerce system. The user friendly content management system allows Andrea to not only easily upload new pieces into her library of products available, but also to easily feature them in a rotating slideshow on the home page. The custom sales reporting system alerts system administrators, in this case – the artist herself, when a sale is made. So go ahead and check out the new and improved JiraCollection.com. See the sparkle and make a purchase for someone special this coming holiday season. Enjoy the gorgeous purple hues and interesting textures showing off Andrea’s 100% original pieces. Want to Know If You Need an Overhaul? If you’re on the fence about updating your website, you can consult our recent blog post with the Top 6 Reasons Your Website Needs a Facelift or just give us a call. We’d be happy to speak with you about your website and set up a consultation so we can learn more about your needs. Check out our portfolio for more examples of our fine web design, or check out our What We Do section to learn about the many services we offer, including print design.